Marlin Beach is a seductive stretch of sand in the heart of the Zona Hotelera in Cancun. Although this beach has turquoise waters and silky sands, yet you should expect strong waves and dangerous currents here. If this beach is crowded, you can walk in either direction to find quieter spots. There's also a small tent where you can rent boogie boards, snorkel gear, and motorized sports equipment. This beach is considered best for snorkeling; surfing and walking. 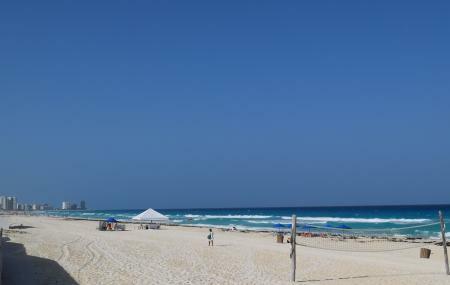 Also, visit the popular attractions in the city by following Cancun itinerary 5 days. How popular is Playa Marlin? People normally club together Playa Ballenas and Grand Oasis Sens while planning their visit to Playa Marlin. This is a really nice Beach. Someone's Chloe paying to have it cleaned up since the local seem to leave all their trash everywhere. But it doesn't seem to accumulate. Very wide beach with very nice Sands. Sunsets here are something to write home about. Exceptional clear across the water beautiful colors oh, and you can have a nice beverage while you watch the Sun go down. So nice! Not very crowded either which is a plus. If you're lucky, you can find a parking spot in the street just before the beach which is free. It's a beach that mostly locals go to, like a secret gem. Not a lot of restaurants or stores nearby but if you plan your time to go, it's not too bad. Also has free showers and public restrooms. Such a beautiful beach. I went there on a Tuesday so it was very peaceful and quiet. It was about 11am, and there might have been less than 30 people there. I was also able to get a massage right there at the beach. May I say that she did an amazing job. Between full body massage and the sounds of the waves I fell asleep almost instantly.